I’ve always loved this dish but never as much as when I found it on the chalkboard menu outside a little restaurant in the town of Edipsos on the island of Evvia. A heaping scoop of barley salad sitting in a big piece of sweet red watermelon – brilliant! The combination of tastes is just so perfect together. 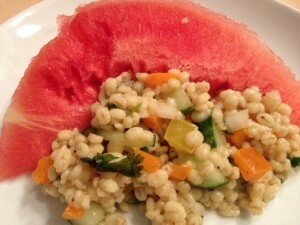 Ever since, when I come across a ripe watermelon, I think of making this recipe to accompany it. 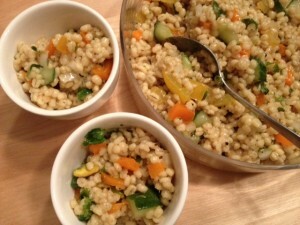 When possible, cook your barley in vegetable broth instead of water to bring extra flavor to the dish. I like to boil about 6 cups of broth for every cup of barley and let it simmer gently until tender. You can also cook it covered like you would rice with 1 cup of barley to 3 cups broth until all liquid is absorbed. Either ways works fine. It’s important to mix the cooked barley into the dressing while barley is still hot. The barley just soaks up the flavors of the dressing like tiny sponges so make sure to have the dressing prepared before barley is done. For this recipe, I usually grind the peppercorns and coriander seeds in my mortar and pestle instead of taking out the spice grinder.Fresh ground spices make a big difference here. And make sure to mix the spices, lemon juice and olive oil well so the flavors get absorbed evenly. Dice vegetables into smaller than bite size pieces. The smaller the better. You don’t want the vegetables to overwhelm the barley. Adding the chopped vegetables to the barley while its still hot actually will cook the veggies slightly, combining all the flavors nicely while still leaving a bit of crunch. Bring vegetable broth or water to a boil. Add barley, stirring well. Reduce heat to a gentle simmer and cook for 40-45 minutes until tender. This will give you about 3 cups of cooked barley. 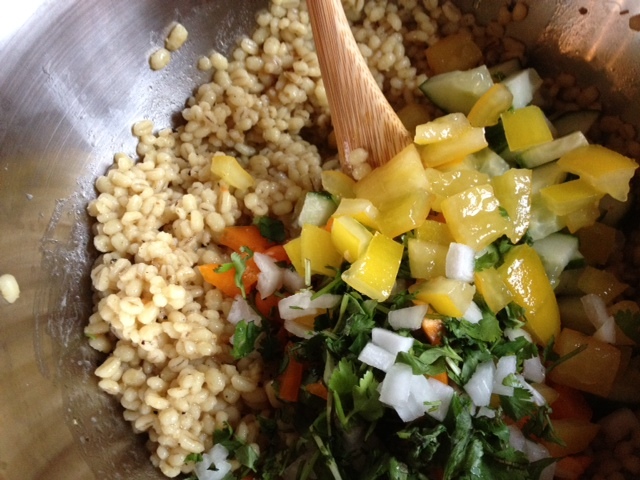 While barley is cooking, combine dressing ingredients in large bowl. Mix well and set aside. 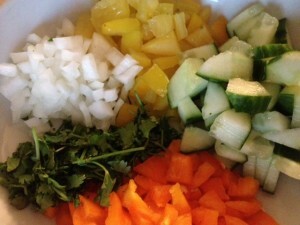 Next, chop vegetables to a fine dice and set aside. 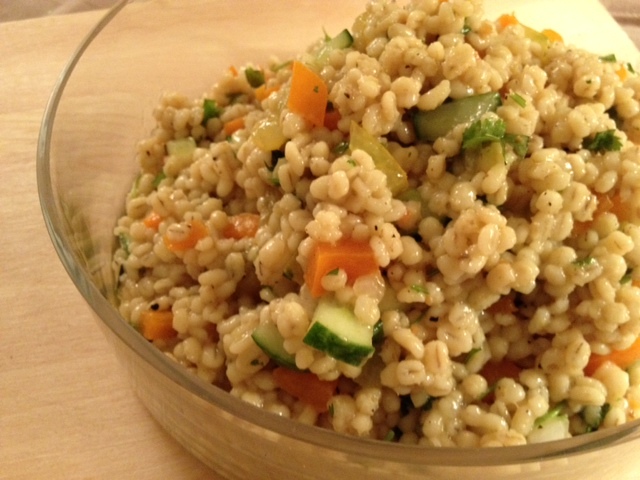 Drain cooked barley, do not rinse, and immediately add to the dressing while still hot. 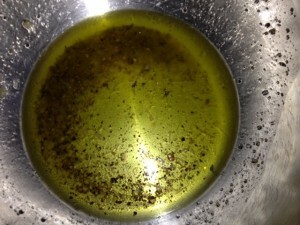 Stir until dressing is completely absorbed. Add chopped vegetables and stir well to combine. You should get 4 good sized main course servings for this recipe. For dinner or main course, 1 cup is usually plenty and as a first course (or for breakfast!) with a slice of watermelon a serving is about 1/3 to 1/2 cup. Just keep in mind when serving that the barley is really filling! Serve warm or room temperature. This is a wonderful take for lunch option and perfect for a picnic, especially with the watermelon! To add another layer of texture, garnish with sliced pistachio nuts.